Thousands of tourists are expected to participate in the Songkran revelry. Pol Gen Chalermkiart Srivorakhan, deputy national police chief, said today (Apr 2) the bans came out of a meeting on safety measures to be enforced during the festival and were intended to boost the confidence of people wanting to celebrate. The use of high-pressure water guns, ice and dirty water would be prohibited, as would drinking alcohol while on a vehicle, firing gunshots into the sky and selling alcohol to people under 18 years old, said Pol Gen Chalermkiart, who chaired the teleconference with senior police and other officials nationwide. Riding in the back of pickup trucks to throw water during Songkran will be allowed, Pol Gen Chalermkiart said. He also sought the cooperation of young people in wearing appropriate clothing during the Songkran celebrations. 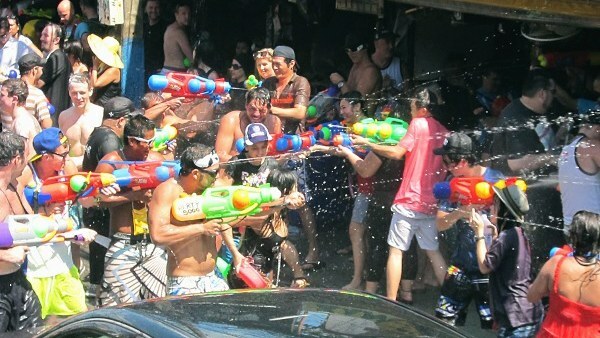 He said thousands of tourists were expected to participate in the Songkran revelry at popular venues in Bangkok such as Khao San, Silom and Asiatique. In the provinces, Khao Niew Road in Khon Kaen, Chiang Mai and Hat Yai of Songkhla were popular venues for Songkran celebrants.